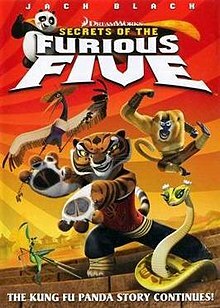 Secrets of the Furious Five (also known as Kung Fu Panda: Secrets of the Furious Five) is an American animated short produced by DreamWorks Animation, which serves as a semi-sequel or spin-off to the animated feature film Kung Fu Panda and appears on a companion disc of the original film's deluxe DVD release. It was later broadcast on NBC on February 26, 2009 and is now available as a separate DVD as of March 24, 2009. The only actors from the film to reprise their roles in this short were Jack Black as Po, Dustin Hoffman as Master Shifu, David Cross as Crane, and Randall Duk Kim as Master Oogway. Angelina Jolie, Lucy Liu, Jackie Chan and Seth Rogen do not reprise their roles mainly because their related characters are depicted as their younger selves. In this short, Monkey is voiced by Jaycee Chan, son of Jackie Chan. Jaycee Chan also voiced Crane in the Cantonese version of the original film. Production of the film was outsourced to Reel FX Creative Studios, who worked on CG animation, and to Film Roman, who worked on traditionally animated sequences. Po (Jack Black) is assigned by Master Shifu (Dustin Hoffman) to teach an introduction to Kung Fu class for a group of rambunctious bunny children. Po tries to explain to the kids that combat is not the only part of what Kung Fu is about, while its true meaning is "excellence of self." To illustrate his point, he uses the stories of the Furious Five's individual pasts and the basic philosophical concepts they learned that enabled them to be great Kung Fu masters. In his youth, Mantis was a petulantly impatient warrior who was prone to jumping to conclusions and making impulsive decisions. When this habit got himself captured by crocodile bandits, the long wait he was forced to endure in his cage allowed him to find the patience to play dead long enough to ambush his captors. Viper, the daughter of Great Master Viper, was born without venomous fangs. Her father, who relied on his venomous bite to protect the village, was despondent that she could never succeed him as a warrior, making her feel timid. One night during a festival, Great Master Viper encountered a gorilla bandit who wore armor hard enough to shatter his fangs when he tried to bite him. Seeing her father in peril, Viper found the courage to fight the bandit and defeat him with her ribbon dancing skills. Crane was an unconfident janitor of a Kung Fu academy until the star pupil Mei Ling encouraged him to seek enrollment in the school. Even though his nerve failed him at the tryouts, Crane accidentally stumbled into the intimidating challenge that determined eligibility and suddenly found the confidence to take the challenge, with his skinny body proving to be an asset that enabled him to succeed. Tigress was an orphan whose status as an apex predator and her destructive lack of control of her strength left her feared and isolated in the rest of the orphanage where she lived. Master Shifu came to kindly teach her the discipline she desperately needed to control her movements until she could perform delicate tasks with ease enough to allay the concerns of the orphanage and the kids that lived there. When she was again rejected for adoption by the adults who were still scared of her, Master Shifu took her in as his student and foster daughter. Monkey was a troublemaker who tormented his village owing to him being publicly humiliated in his youth. He defied all attempts to force him to leave by removing his assailants' belts that held their pants up until Master Oogway confronted him and defeated him in a fight (since he wore no pants), deducing the cause of his anti-social behavior. Rather than making him leave the village as per the challenge, Oogway told him to stay and encouraged him to show compassion to others, as he would want in similar circumstances. At the end, Master Shifu returns to see Po's anticipated lack of progress teaching and he's surprised that he underestimated Po's talents yet again, considering how much Po's students have learned. But when the bunnies ask Po how his first day of Kung Fu was, all the unpleasant memories during the original film flash through his head; he then proudly says, "It was totally awesome!" Note: Mr Ping didn't appear in the short, only on the DVD cover of the film. Secrets of the Furious Five has received eight nominations in the "Animated Television Production or Short Form" category at the 36th Annie Awards, of which it received four ("Character Animation," "Character Design," "Music," and "Production Design"). The individual DVD release has received much criticism from consumers confusing it for a feature-length production. The UK DVD release is described on the packaging as "The Next Kung Fu Panda Adventure", implying that it is a sequel to the first as opposed to a spin-off. ^ Simon, Ben (2008-11-30). "Kung Fu Panda / Secrets Of The Furious Five". Animated Views. Retrieved 2010-11-06.